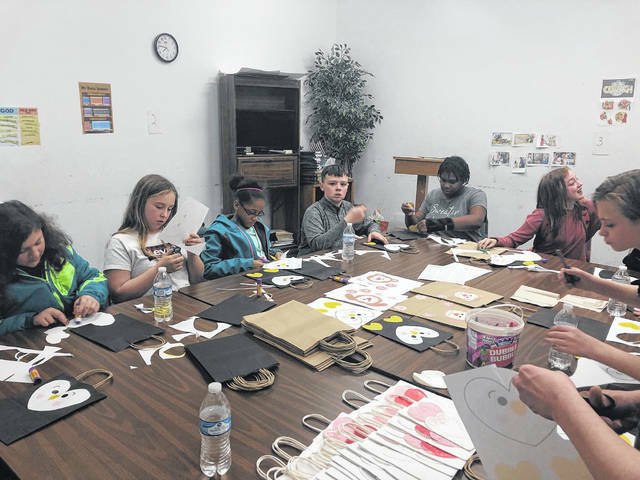 The Holy Hurricane Club at Wilmington Middle School gives a hand to Brylin Ruddle, fourth from left, in constructing the nearly 500 Valentine’s bags to make sure no elementary student goes without a bag. Brylin Ruddle sits among the numerous bags constructed to make sure no Wilmington elementary student goes without one. WILMINGTON — This Valentine’s Day, one sixth-grader is making sure every kid feels special. 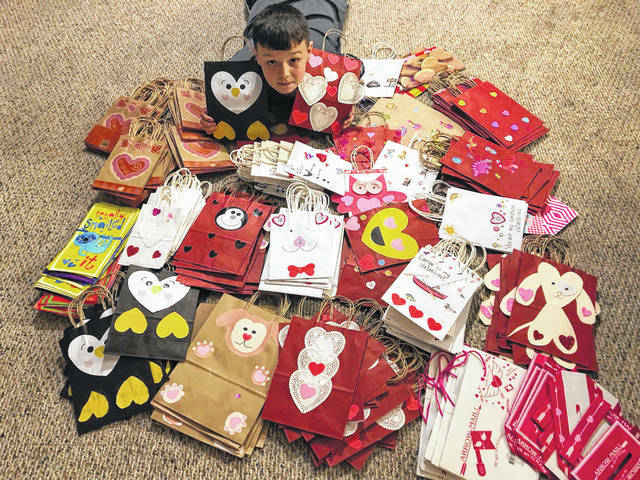 Brylin Ruddle, along with some help, has constructed 500 Valentine’s bags to hand out at Wilmington’s elementary schools Feb. 14, just in case some youths don’t have them. The idea came about when he remembered seeing classmates without a bag last year. “When I was in fifth grade, I remember how some kids were disappointed or sad that they didn’t have their own Valentine’s bag and I wanted to cheer them up,” said Brylin. He then brought the idea to his mother, Latasha, who was thrilled to hear of her son doing this. “I’m a proud mama,” she said. After explaining his idea, Latasha told Brylin to form a plan of action, which included emailing the principals of each school and then getting some extra help from his siblings as well as friends in the Holy Hurricane Club. Each bag is decorated with different designs so the kids can have a variety of choices to pick from, with a Bible verse at the bottom of each bag. Almost all the material used to make the bags was donated after Brylin published a video on Facebook letting people know abouthis project. The bags were delivered to the schools the day before; a student that needs one can simply pick one up at the office. Brian Camp, assistant principal at Wilmington Middle School, was thrilled to hear of this middle-schooler’s project. As for Brylin, he just hopes to spread some good words and hopes everyone has a happy Valentine’s Day.